Are You Playing Small or Choosing the Highest? 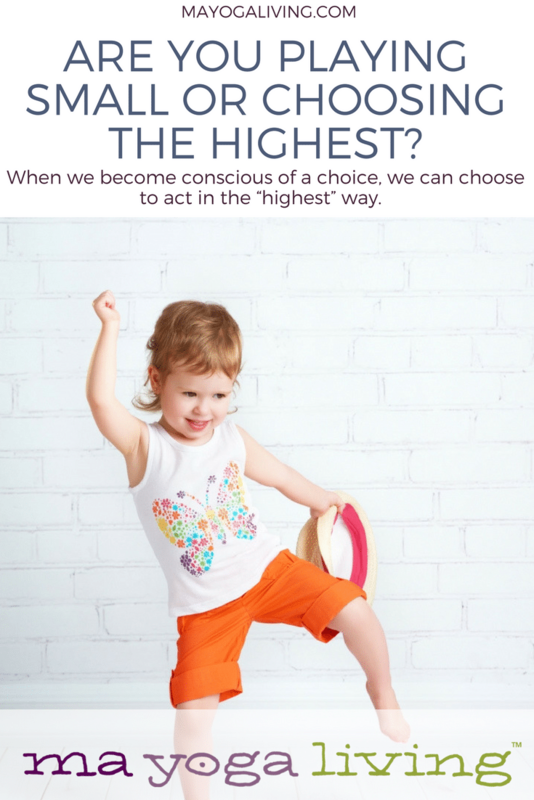 When we become conscious of a choice (and many choices that we make throughout the day are automatic, like make the coffee, wake the kids), we can choose to act in the “highest” way. What is the highest way? It is simply acting in the most life-enhancing, beautiful, nurturing, wise and powerful way we can think of – that’s still authentic to us. I fought this idea for a long time. Well, pretty much all my life. It’s why I like teaching. I get to truly be there in my “highest” Self, which was different from how I seemed to present myself in other areas of my life. I was fine with being my full, goddess Self on my mat, and even around the yoga studio, but if I’m honest, I was more interested in making other people around me feel good the rest of the time. If I had to demean myself to do it, so be it. They walked away feeling good about themselves, and I felt I had done my job. This is an example of what it means to be playing small. And yet, I’m 50 years old this week and just now, for the first time, realizing that I have been playing small since I was a child. Children, of course, naturally go big. Why do we let it go? I always had big visions and followed them no matter what – a school of yoga dedicated to the needs and opportunities of moms and moms-to-be; a community of local “Mama Circles”; a global yoga and education platform for pregnant women and moms. But when it comes to talking about my path to people, I felt it would be overwhelming, so I chose not to talk about it much. I didn’t share my enthusiasm or my excitement. By shutting this down around others, I was shutting people out. I wanted to talk about day to day issues and personal evolution and growth, especially other people’s. By focusing on others, I wouldn’t have to hear someone say “wow, Jess, that’s amazing” in a way that sounded more to me like “you’re really annoying for doing all of those things, and I wish you’d stop talking about it” to me. It’s hard to be “big.” In the moment, we might feel kind of lonely, as people have their unique reactions to us. But in reality, it’s more lonely and isolating to play small. When you let yourself be the fierce, funny, wise spirit that you are in a body – people see you – the true you. Some will not want to be around it. But it’s the only way to find your people. There’s a syllable in Sanskrit that means the highest. Ma. When it’s in front of an energetic channel, as in Maha Vaha Srota – it means the single most vital channel there is; in this case, the digestive tract. Where we change what’s outside to what’s inside. The place, according to Ayurveda, where all disease begins. When Ma is paired with a goddess name, it means the mother of all goddesses. Kali Ma. 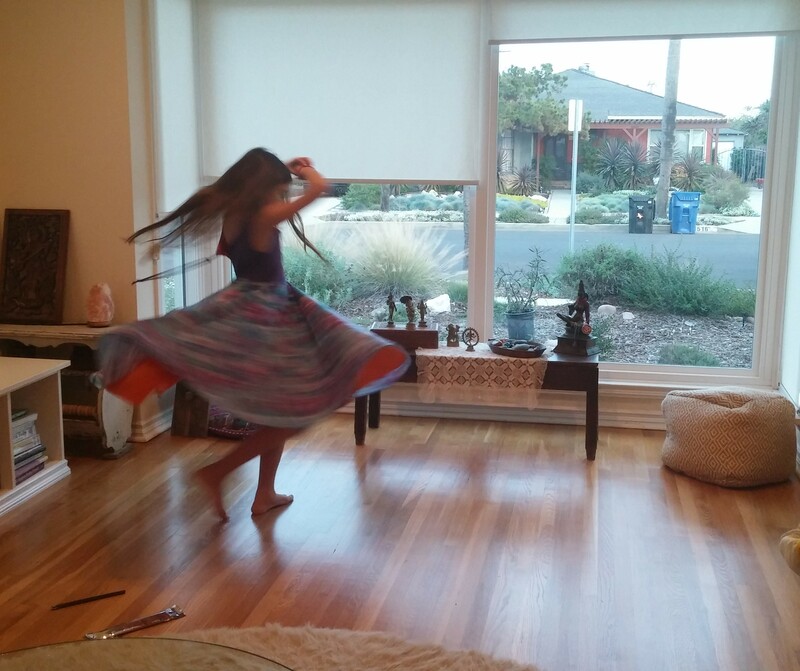 The one who has loved all of the rest into being with her primal, creative energy. Each us of us has the power to be big. To be that awesome mother protecting whatever it is we love; but also to have that same fierce, protective attitude about ourseves. When we choose to stay in our wisdom and our power and not back off energetically from the love that’s flowing through us: that’s a gift we can give to the world around us. When we act in the highest, we are in every moment being a model for what’s possible to everyone who comes near. Even if it’s as simple as getting off our phone to connect to the cashier. Or turning off the radio when it gets too much and choosing instead to notice to what’s beautiful in the world, and share it. Or listening, and letting the person you’re with just feel your support and love. Reflecting back to them their big Self, lifting them up, from the highest place within ourselves: love.